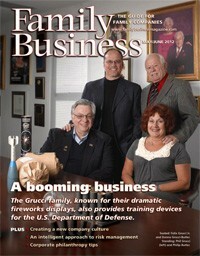 Family Business Magazine--May/June 2012 Publish at Calaméo or browse others. Can you revive your distressed family business? Family businesses have been the backbone of the American economy for years. Entrepreneurs entered industries with low barriers and grew prosperous enterprises through ambition and perseverance. But the start of the 21st century saw the sale of many family-owned businesses as second- and third-generation owners chose to monetize their investments. The family companies that remained found themselves competing against companies where sales growth and EBITDA, rather than family values and long-term profitability, were the overriding goals. The pain and shock of the recession has made many family business owners wish they’d better assessed the risks they took in boom times. Too many business leaders accepted risk unnecessarily or without adequate compensation simply because they did not consciously address it. After Facebook’s blockbuster IPO filing, the business press overflowed with articles about the value of social networks. Lamentably, not enough attention is being paid to the value of social capital. Wikipedia defines social capital as a sociological concept that “refers to the value of social relations and the role of cooperation and confidence to get collective or economic results.” In other words, your organization’s financial performance is affected (a) by the way that people in the organization treat others and (b) by the organization’s involvement in the community. When faced with a problem, we all desire simple solutions. For many family business owners, however, the respective dynamics of the business and the family create a complex environment. The process of business succession proceeds smoothly only when the relevant concerns are identified in detail and less relevant issues are disregarded. Once core objectives are determined, it is easier to apply a solution. There were about a dozen hosiery mills throughout New England in 1978, when Marc Cabot and a minority partner founded Cabot Hosiery Mills in Northfield, Vt. Today, Cabot Hosiery Mills is the last mill in New England, though the original facility was replaced in 1995 by a building more suited to high-speed, computer-driven equipment. Cabot Hosiery Mills is the second-largest employer in Northfield, with a staff of about 130, some of whom have worked there for more than 30 years. It has been 100% family-owned since 1995, when Marc’s son, Ric, purchased the partner’s shares.